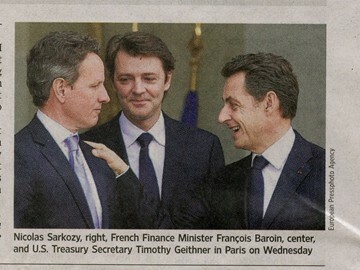 Roanoke Times, 12-9-11, Pg 7: European debt blamed again as market drops. Obama wants to cut the current taxes that fund Social Security. Social Security Trust Fund is scheduled to go broke in 2020 with current tax funding. Let’s not cut spending, let’s just throw grandma under the bus! Obama has killed the Canadian oil pipeline to our refineries on the Gulf Coast until after the 2012 elections thereby forfeiting tens of thousands of jobs and loosing the opportunity to make a significant reduction in US dependency on Muslim-Oil. Obama sent you here to tell us about financial management? 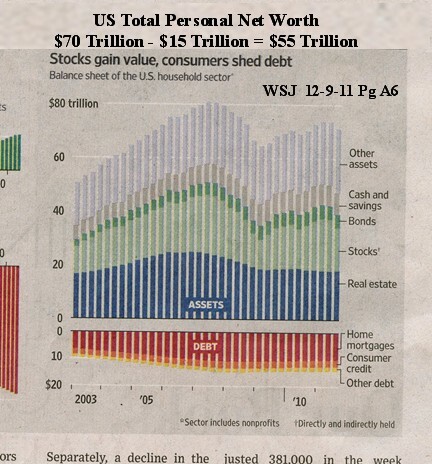 And Obama continues to hype increased taxes as the way to put people to work and solve our debt problems; However: our total personal net worth is $55 Trillion while our unfunded liabilities are $ 62 Trillion. Therefore total confiscation of all the personal net worth in the US will not solve our indebtedness problem; So much for taxing our way out of our financial mess. Hindsight wisdom: should have bought gold at $850 the day Obama got elected!